State law requires public water systems (PWS) to test for and remediate certain contaminants in drinking water, including lead and copper, and prohibits the use of any pipe, pipe or plumbing fitting or fixture, solder, or flux that is not "lead free" in the installation or repair of any public water system or any plumbing in a facility providing water for human consumption, except as specified. Under the Lead Service Lines section of the California Health and Safety code, Section 116885, added by Senate Bill 1398 (2016) and amended by Senate Bill 427 (2017), requires all community water systems (CWS) must compile an inventory of known partial or total lead user service lines in use in its distribution system by July 1, 2018. The inventory is to include all user service lines that are active and those that are reasonably expected to become active in the future. Also, the bill requires CWS to identify areas that may have lead user service lines in use, and/or identify any areas within the CWS distribution system that includes materials used for the service line that cannot be identified. CWS will further be required to propose a schedule to replace all the known lead user service lines and user service lines constructed of unknown material by July 1, 2020. 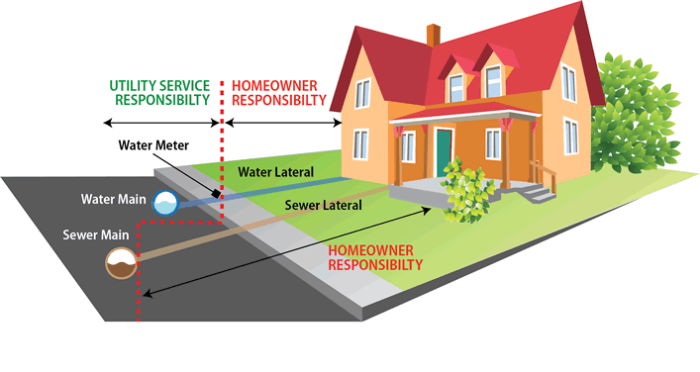 California Code of Regulations, Title 22, Section 64551.60 contains the definition of “User service line", which means the pipe, tubing, and fittings connecting a water main to an individual water meter or service connection but does not include the service line from the meter to individual homes. The inventory only contains information on the pipe owned by the water system from the main water line to the meter. After completing the inventory, CWS must provide the State Water Resources Control Board by July 1, 2020, with a timeline for replacement of lead user service lines in the distribution system. In addition, in areas where the material of the user service line is unknown, CWS must determine whether those service lines contain lead or provide the state board with a timeline for replacement and acquire State Board approval. For more information, please see our Frequently Asked Questions (FAQ) document (link in the Resources/Supplemental Material section). What is My Community Water System Required to do? HSC Section 116885 requires all CWS to inventory partial or total lead user service lines in its distribution system. The inventory must include all user service lines that are active and those that are reasonably expected to become active in the future. Also, Section 116885 requires the CWS to identify areas that may have active lead user service lines and/or identify areas within the distribution system where the CWS cannot identify the material. CWS will be required to propose a schedule to replace all user service lines that contain lead or unknown material. Who is required to comply with HSC Section 116885? All CWS must comply. The definition of a CWS “means a public water system that serves at least 15 service connections used by yearlong residents or regularly serves at least 25 yearlong residents of the area served by the system." A CWS should have a domestic water supply permit issued by the Division of Drinking Water (DDW) or one of our Local Primacy Agency (LPA) partners. Start to inventory user service lines and identify areas of known lead user service lines and areas that may have lead user service lines (user service lines whose content cannot be determined). Resources to assist with an inventory are listed below. All CWS will need to provide DDW a certified form explaining the results and detailing how the inventory was conducted. how the inventory was determined and the results. DDW will utilize the 2017 electronic annual report (eAR) to gather this information. DDW has added the Lead Service Line Replacement (LSLR) Section into the 2017 eAR. After completing the LSLR Section, the CWS can print a copy of the inventory form for a water system representative to sign, attesting under penalty of perjury that, to the best of their knowledge, the submitted information is an accurate and thorough inventory of their service line. The certified form can then be scanned and uploaded to the eAR Portal. If the CWS indicates the existence of areas with lead user service lines, unknown material user service lines or lead goosenecks associated with user service lines, a map(s) will need to be uploaded for those areas. Maps need to be in a GIS layer, google earth .kml/.kmz file, or PDF format. DDW has encouraged water systems to notify customers if lead user service lines are identified from the meter to your home. To determine if any lead user service lines exist in your service area, click on the map below and find your water system. If you are concerned about lead pipes or fittings on your side of the meter you may contact your water system for assistance or a hire a plumbing expert to have your portion of the service line checked for lead (see diagram below). DDW has added a Frequently Asked Questions for Customers in the Resources/Supplemental Material section below. 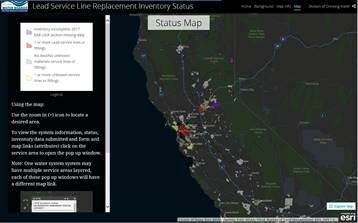 The Service Line Inventory (SLI) Status map displays the SLI status based on the data collected in the 2017 Electronic Annual Report (EAR) Lead Service Line Replacement (LSLR) section. The law defines the lead fittings as anything that connects the main water line to individual water meters. The online map allows any member of the public to click on a specific service area to open a pop-up window that provides inventory data about the condition of pipes and fittings within their service area. The map is divided into four categories: Lead in the system; no lead in system; unknown service lines or material; and incomplete information. DDW will be collecting LSL data from water systems using the Electronic Annual Report (eAR) web portal. Additional instructions on filling out the portion of the LSL in the Electronic Annual Report (eAR) web portal will be coming in January 2018.